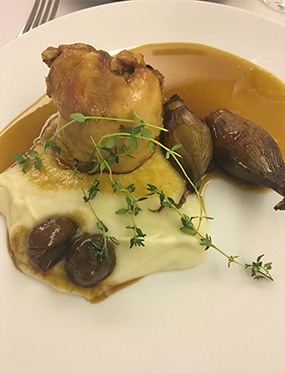 Every great meal should be paired with a great glass of wine! 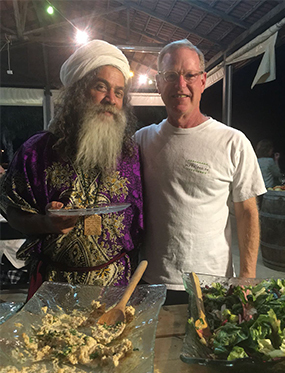 A mission highlight included a visit to Tulip Winery located in the north of Israel in Kfar Tikva, Village of Hope, which is a community settlement for adults with developmental and emotional disabilities. 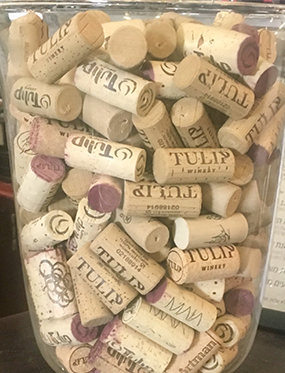 Tulip Winery employs these individuals with the business platform and tools needed to succeed in any similar market. 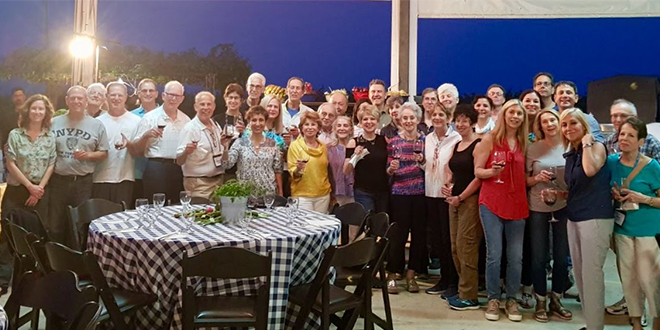 We sampled a variety of dry and sweet wines while learning about this boutique winery, the largest in Israel. Their signature wine, Black Tulip, is a Bordeaux style blend is full of potent fruit aromas and flavors of black currants, cassis, black cherries, and tart blackberries. 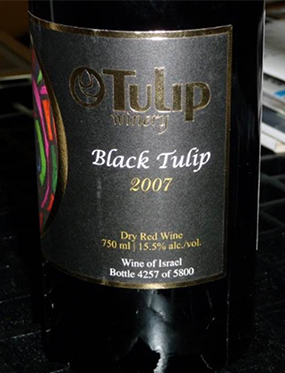 Most notable though, Black Tulip’s simple black wine label is just that – because Tulip Winery believes no individual, regardless of ability, should be labeled. 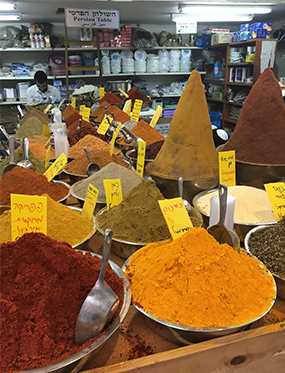 Some of Israel’s finest flavors come from rich spices. 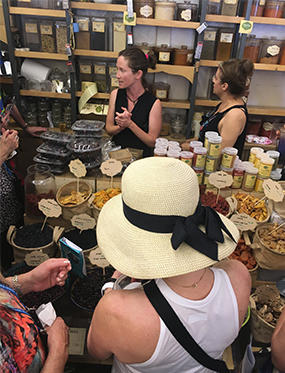 While in Tel Aviv, we visited several shops in the Levinsky Market and learned about its history which dates to the 1920s. 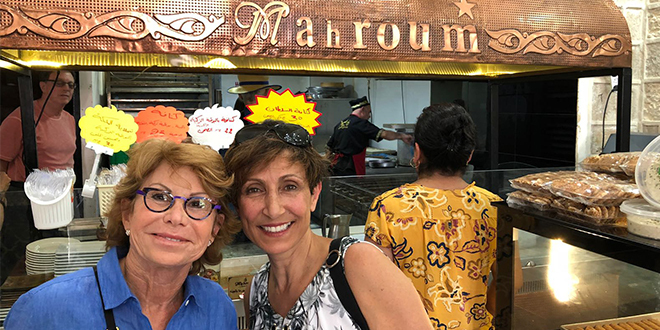 Founded by Balkan immigrants who brought their local flavors and traditions, today multi-generational families work side by side to tell the story of Israel’s ethnic and culinary history, and sell some of their best products. 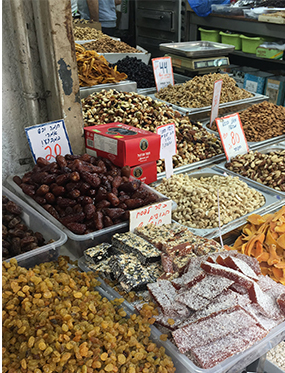 We sampled baked goods, dried fruits and nuts, cheeses, and smelled the aromas of dozens of spice mixes. 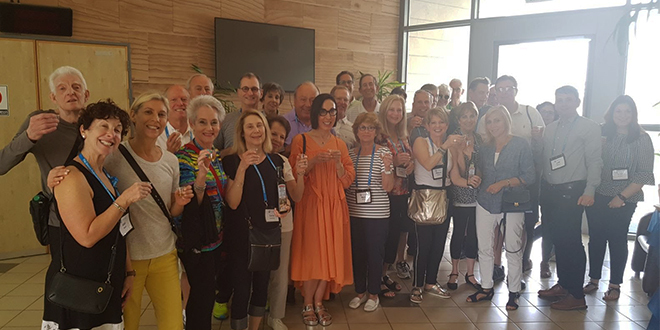 On our final day in Jerusalem we spent time with one of the Jewish Federation of Cleveland’s beneficiary agencies, Jewish Agency for Israel (JAFI). 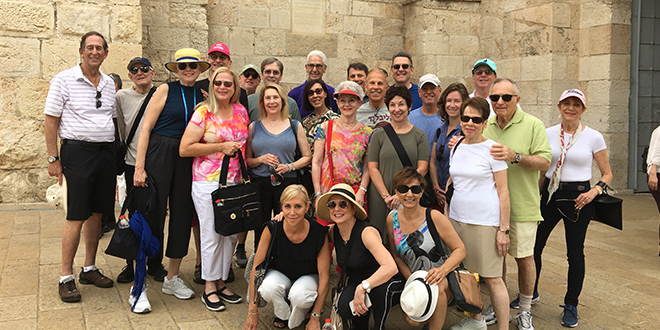 JAFI is best known as the primary organization for fostering the immigration (Aliyah) and absorption of Jews from the Jewish diaspora into Israel. 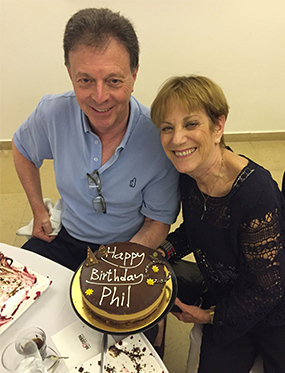 Over the last 70 years, JAFI has helped 3 million people make Aliyah. 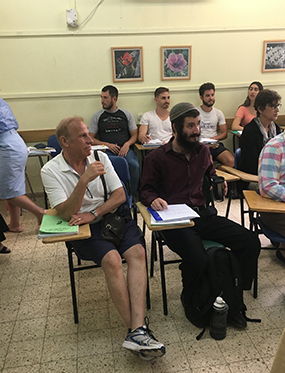 We met with Amira Aharonovich, COO of JAFI, and toured Ulpan Etzion, an absorption center that offers intensive Hebrew-language instruction, housing, career assistance, and more to young adults in their 20s and 30s who move to Israel. We had the incredible opportunity of meeting and asking questions of a panel of Olim from various countries including the Former Soviet Union and France, and visited classrooms to better understand their experiences and daily activities. 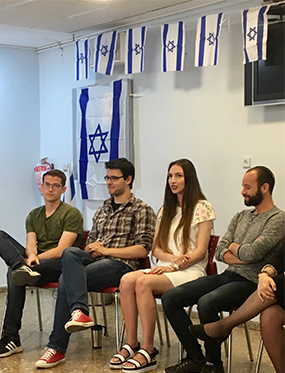 Several students candidly shared their aspirations, challenges, and goals as they emerge themselves into Israeli society. This site visit was a perfect space to see firsthand our campaign dollars at work! 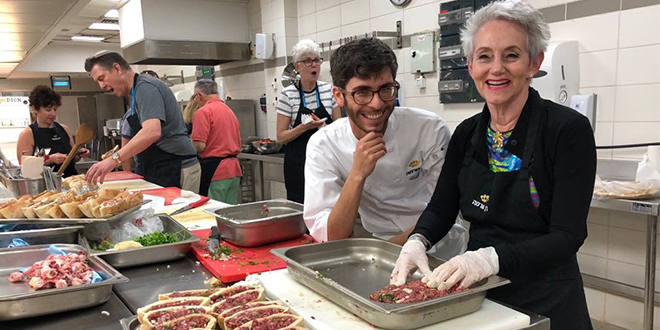 The Flavors of Israel mission enjoyed sophisticated and nuanced recipes reflecting the most modern cooking techniques. However, we also were witnesses to the cultivation of a food which is 4 billion years old. 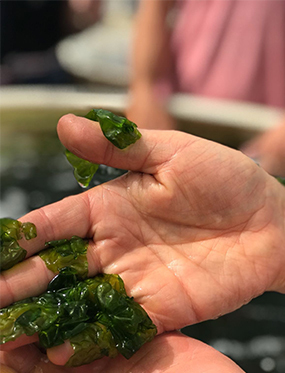 The Seakura company is considered to be the world leader in harvesting and manufacturing seaweed! They produce over 100 tons per acre per year of Seaweed which is the most nutritionally dense food either under or over the sea. Israel is sharing this technology around the world especially in areas with lots of salt water and very little fresh water. Another example of being a light unto the nations! 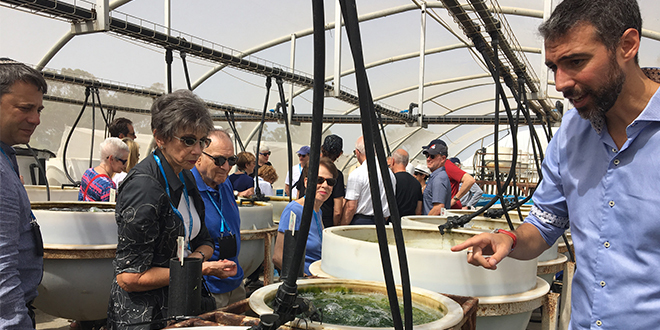 Our group was one of the first visitors to the cultivation center and we were treated to not only raw seaweed but many wonderful dishes and treats created with it. 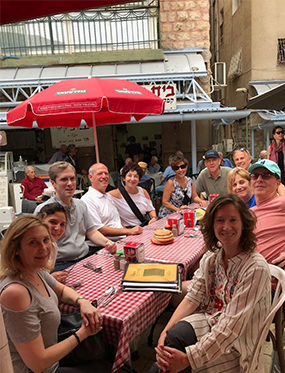 Travel participants were given an amazing opportunity to meet with Noga Nir Ne’eman to discuss the implications of cost of living, including food, for the social fabric of Israeli society. Noga is the TV chief correspondent and anchorwoman of Channel 10. She outlined how food pricing is handled in Israel, the government subsidizing sugar, salt, margarine and white bread. Surprisingly, Israel has the highest rate of obese children in the world under 12. There is an ongoing struggle of government regulation versus retail competition as citizens are fighting for their rights to healthy food. 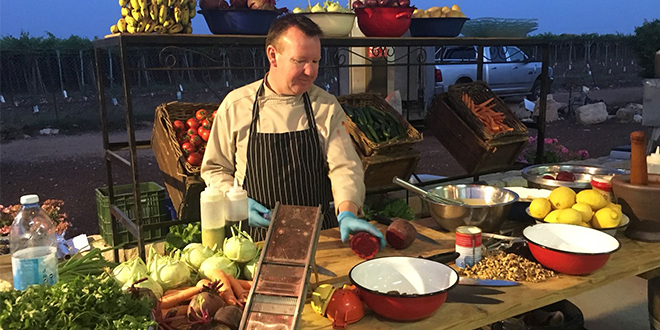 A new labeling law has been passed but not implemented which would mark foods with either a red or green sticker signaling unhealthy versus healthy choices. 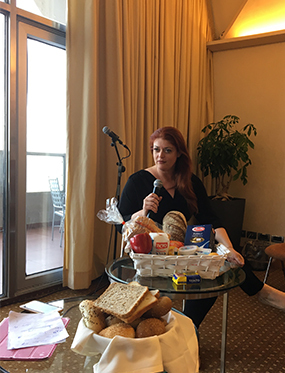 We had a lively and eye-opening discussion as she pulled back the veil on the political economy of food in Israel. 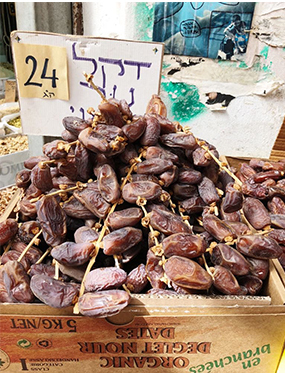 Machne Yehuda market, often referred to as "The Shuk", is a marketplace (originally open-air, but now partially covered) in Jerusalem. 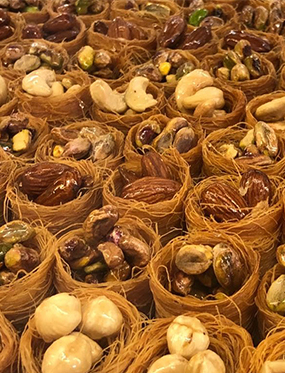 Popular with locals and tourists alike, the market's more than 250 vendors sell fresh fruits and vegetables; baked goods; fish, meat and cheeses; nuts, seeds, and spices; wines and liquors; clothing and shoes; and housewares, textiles, and Judaica. The market is a cacophony of sights, sounds, colors, scents, and bustling humanity. Participants wandered, purchased, ate and enjoyed this iconic and wonderful place! 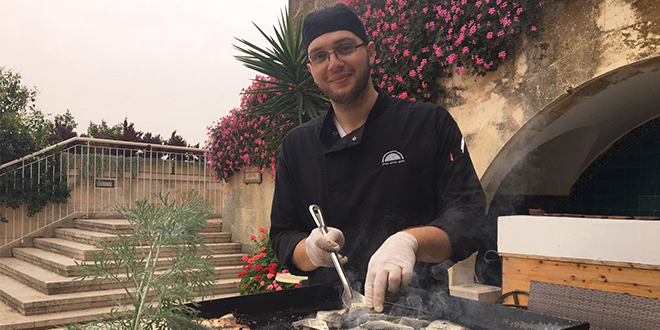 The Flavors of Israel mission is more than just eating marvelous food. It is also about understanding food production and environmental science. The Volcani Institute is Israel’s agricultural research organization. The travelers met with Tali Gottlieb, the COO of Volcani International who outlined the ambitious and life changing work at Volcani. 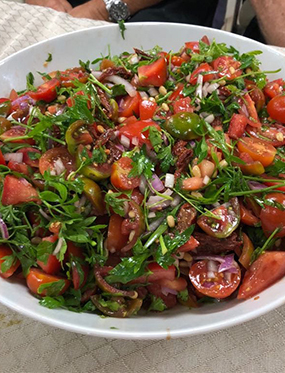 Established in 1921, Volcani institute achieved agricultural miracles by making the desert bloom and set the stage for Israel to become a world leader in agriculture research. 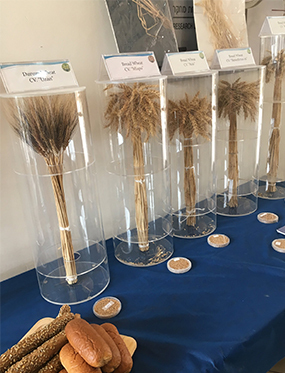 By developing Agro – technical methods to achieve food security, and sharing that expertise around the world, Israel develops trusted relationships with other countries and contributes to the well being of humanity and global peace. Please take a look at their website www.Volcani.org Our visit ended with an olive oil tasting and a shot of etrogcello (Not sold in stores)! 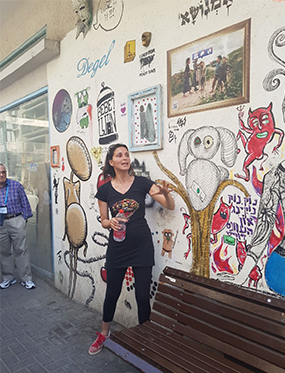 The Flavors of Israel Mission began with a graffiti tour led by artist Murielle Cohen through the streets of Tel Aviv. 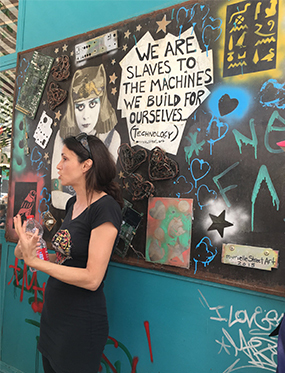 We explored her works of art on the urban walls of several neighborhoods, and got a taste of the many ways her creativity adds life and color to the area. Murielle is known for her 30 second portrait drawings, without looking on to the page. She often leaves a short sentence describing hidden secrets of each soul that she draws – leaving much to the imagination. Murielle’s street art incorporates a variety of subjects including technology, recycled collages, dancers, pin ups, and puzzle poems. Graffiti artists like Murielle have the freedom to express themselves in vast ways as the walls of Tel Aviv come to life! 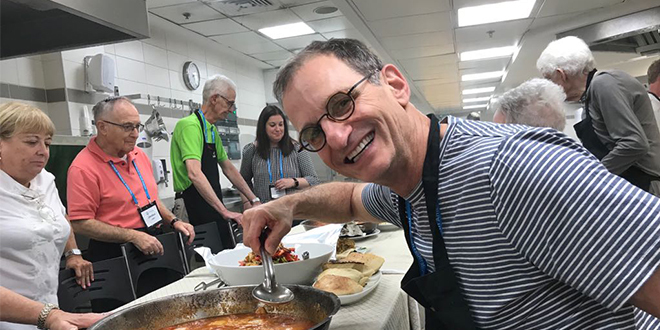 Missions and Travel experiences with the Jewish Federation of Cleveland take Jewish Clevelanders behind the scenes of our global Jewish community. See the country. Live the culture. Meet the people. And, get premiere access like no one else can. For more information, contact Shelley Milin Marcus at smarcus@jcfcleve.org or 216-593-2847.